With a blend of high-quality protein from milk, whey, and egg proteins, this mix provides you with both fast- and slow-digesting nutrients — making it the perfect choice for a filling breakfast. Plus, with each low-sugar serving containing only 191 calories and 3.2g of fat, they’ll taste like a treat but won’t undo all of your hard work at the gym. 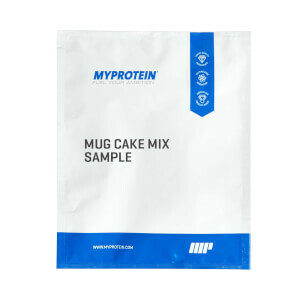 When to enjoy Protein Pancake Mix? These are an ideal way to start the day, but you can enjoy them whenever you fancy a protein boost — top with fruit, yoghurt, nut butters, or syrup for a sweet, nutritious treat. To make your own protein packed pancakes simply add 2 large scoops (50g) to 100-150ml milk or water and mix together. Heat a frying pan over a high heat and add a small amount of oil/butter then reduce to a medium heat and add the batter to the pan and cook. Check out The Zone for some delicious pancake inspiration! 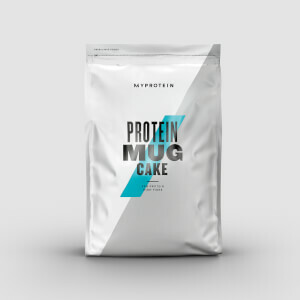 What to enjoy Protein Pancake Mix with? Get your day off to a sweet start by whipping up some of our Protein Pancake Mix and topping with our Sugar-Free Syrup — it’s calorie-free, so you don’t have to worry about being too generous with it either! Chocolate Flavour: Protein Blend (31%) (Whey Protein Concentrate (Milk), Milk Protein Concentrate, Egg White Powder), Ground Oats (13%), Cocoa Powder, Medium Chain Triglycerides (MCTs) (68-75%), Sodium Caseinate (Milk), Glucose Syrup Solids, Emulsifier (E472c), Raising Agent (Sodium Bicarbonate), Sweetener (Sucralose), Emulsifier (Soy Lecithin). 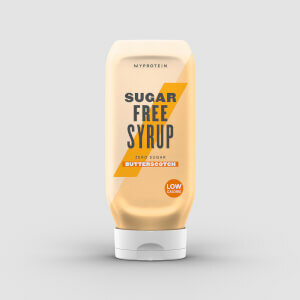 Golden Syrup Flavour: Protein Blend (31%) (Whey Protein Concentrate (Milk), Milk Protein Concentrate, Egg White Powder), Ground Oats (13%), Flavouring, Medium Chain Triglycerides (MCTs) (68-75%), Sodium Caseinate (Milk), Glucose Syrup Solids, Emulsifier (E472c), Raising Agent (Sodium Bicarbonate), Sweetener (Sucralose), Emulsifier (Soy Lecithin). 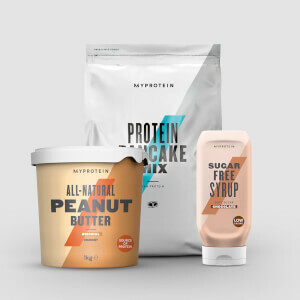 Maple Syrup Flavour: Protein Blend (31%) (Whey Protein Concentrate (Milk), Milk Protein Concentrate, Egg White Powder), Ground Oats (13%), Flavouring, Medium Chain Triglycerides (MCTs) (68-75%), Sodium Caseinate (Milk), Glucose Syrup Solids, Emulsifier (E472c), Raising Agent (Sodium Bicarbonate), Sweetener (Sucralose), Emulsifier (Soy Lecithin). Unflavoured: Protein Blend (35%) (Whey Protein Concentrate (Milk), Milk Protein Concentrate, Egg White Powder), Ground Oats (12%), Medium Chain Triglycerides (MCTs) (68-75%), Sodium Caseinate (Milk), Glucose Syrup Solids, Emulsifier (E472c), Raising Agent (Sodium Bicarbonate), Sweetener (Sucralose), Emulsifier (Soy Lecithin). Matcha: Whey Protein Concentrate (Milk, Soy Lecithin) (35%), Milk Protein Concentrate (Soy Lecithin) (35%), Free Range Egg Powder (13%), Oatflour (13%), Flavouring (Sweeteners (Sucralose), Flavouring Substances), Medium Chain Triglyceride Powder (Milk), Green Tea Extract Powder (1.5%), Raising Agent (Sodium Bicarbonate). As a massive foodie this mid morning meal really hits the spot. 100% luxury. At first i didn't really think much of the pancake mix but with my experience as a chef I decided to persist and managed to perfect it! Here's how: 50g Pancake Mix (I use the maple syrup) 125ml water (this may look a bit thin when added but trust me on this ;) ) Optional: Dried/fresh fruit and/or nuts (make sure you cut the fruit up into little bits and crumble the nuts) 15g Mascapone 25ml Apro Hazelnut milk Heat a non stick pan to hot/very hotBreak down any lumps in the pancake powder with the whisk before adding the water. There is no need for any oil/butter/spray oil, they will not stick. Pour in the water all at once and whisk for say 30 seconds until smooth. Pour half of the mix into the pan evenly (making sure the pan is flat). Sprinkle on half of your prepared nuts and/or fruit. Now here's the important bit: make sure you only cook the first side jsut to the point where it starts to pubble and theres still a little liquid ontop. Now using a spatula, carefully flip it over. The pancake is now 90% cooked. Cook the second side now for literally a few second, this way the its still going to be nice and moist inside as the pancake has still maintained it's moisture. Repeat again for the second pancake. Now I like to mix the mascapone and hazelnut milk until it starts to froth. Then pour over the top (this makes the pancake super moist). Enjoy guys, you will not regret buying this. I get a bag of the golden syrup mix every order and I can tell you that this pancake mix must have been made from ground angel wings, a pinch of pure happiness and a dusting of Megan Fox because these are positively delightful! 250ml of skimmed milk, 4 level scoops of mixture and you will have noises coming from your mouth that should be reserved for the bedroom!! Keep the pan heat reasonably low, mix one scoop at a time into the milk and the consistency is perfect every time! They will keep you full for hours and get your protein intake going first thing in the most enjoyable way! Top with pure peanut butter and you will refuse any other pancake again! I like to take mine at breakfast, but the girlfriend likes them cold for lunch as well! Take your pick! The only regret is that your bank balance will never be the same again after ordering over and over again! Perfecto! Peanut butter, banana, coffee, anything! I was so excited to taste these for the first time! So dissapointed.. I ordered the maple syrup flavour and expected it to be sweet. However, this is too much! I had two bites and couldn't finish them. Even my fat free Greek yoghurt couldn't cut through the sweeteness! I am going to go back to making them from scratch. First of all the mix tastes and smells too sweet that it’s nauseating! The texture is tastes too fake, like edible plastic if we knew what edible plastic tasted like. Throwing this away because trash, just like I thought! Horrible taste! I am so upset with this product! The concept is great, they mix well (though I had to search online for instructions/ratios as these weren’t on the packet). The problem is, these are disgusting! All they taste of is artificial seeetner. Like, really, really bad! This pancake mix is just far too sweet. I made the pancakes with water and could barely eat them. The taste of sweetener is very strong and remains in your mouth. I certainly didn't need to add anything to my coffee after trying these pancakes! Some powder mixed with Greek yoghurt and banana is a tasty combination. As other reviewers have said, very tasty once you perfect your own formula. Good to see others putting up what they put with theirs so here's mine. I usually do the mixture the night before and have it for breakfast as I am up at 0445 on work days. Firstly I put approx 250ml of semi-skimmed milk in my smoothie mixer. Then I use 2 scoops (50g) of pancake mix and 2 scoops (80g) of instants oats and 2 tsp of cinnamon. I mix for around 20secs. This will make 2 medium pancakes for me. A few mins each side on the frying pan and all is perfect. I top the first pancake with 1 chopped banana and some MySyrup. The second pancake I spread a small amount of Nutella on and 1 tsp of honey and place on top of the first pancake. I may replace the Nutella with the chocolate MySyrup at some point to This is a great start to my day every day! The whole portion is approx 850kcal, 115g Carbs, 19g Fat (6g sat fat) and 52g Protein. Love it. MyProtein Instant Oats, banana, MySyrup, cinnamon, honey, nutella.